My list of Favorite Film Discoveries of 2017 has now been posted at Rupert Pupkin Speaks! It's always a challenge to whittle an entire viewing year down to a handful of films, but I was happy with my final list and hope it will inspire others to seek out some of these titles. There are 10 films described in my post, with another 10 "Honorable Mentions" at the very end of the list. For more information on any title on the list, just put the title in the search box at the upper left corner of the page here at Laura's Miscellaneous Musings to pull up a complete review. I'm very appreciative to Brian for the invitation to participate in this terrific annual event and for sharing my list at his blog. Previous Favorite Discoveries Lists: Favorite Film Discoveries of 2013, Favorite Film Discoveries of 2014, Favorite Film Discoveries of 2015, and Favorite Film Discoveries of 2016. Additional guest posts at Rupert Pupkin Speaks: Five Underrated Comedies, Five Underrated Westerns, Five Underrated Mystery/Detective Films, Five Underrated Action/Adventure Films, Five Underrated Thrillers, Five Underrated Films of 1955, Five Underrated Films of 1945, Five Underrated Films of 1956, and Five Underrated Films of 1947. One year after THE MALTESE FALCON (1941), three of that film's stars and its director John Huston reunited for the Warner Bros. WWII spy thriller ACROSS THE PACIFIC (1942). Humphrey Bogart plays Rick Leland, who's court-martialed and drummed out of the army prior to Pearl Harbor. He tries enlisting in Canada without luck and ends up on a Japanese boat headed south along the East Coast, destined for the Panama Canal. 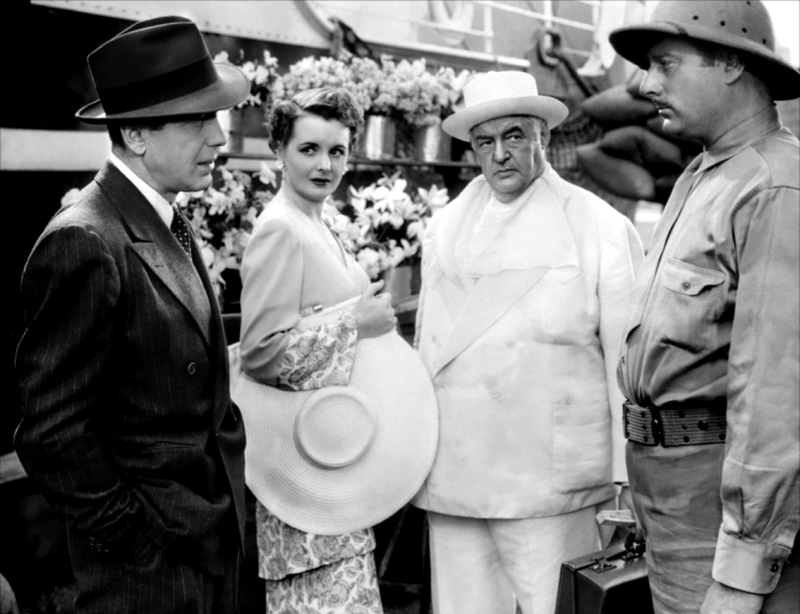 The lone regular passengers, other than himself, are a Canadian woman, Alberta Marlow (Mary Astor), and a professor, Dr. Lorenz (Sydney Greenstreet), who seems to know a great deal about the Japanese. It soon becomes apparent there's more to Rick than meets the eye, as during his travels he periodically meets with men in nondescript offices to exchange intelligence data. It evolves that Rick is up against operatives supporting Japanese plans to destroy the Panama Canal. ACROSS THE PACIFIC is somewhat meandering in its 97 minutes, but I found it quite enjoyable. 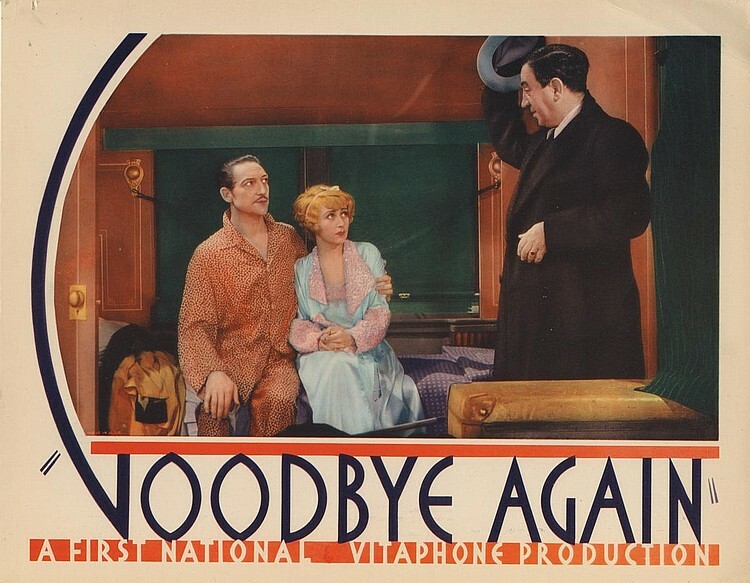 It's unexpectedly humorous, particularly in the first half, and the repartee between Bogart and Astor is great fun. The suspense builds nicely, ratcheting up in intensity as the action-packed climax approaches. The movie looks terrific, with sharp, inky blacks, filmed by Arthur Edeson. I especially enjoyed the shipboard set. All in all, the movie's a great exemplar of the WB "house style." 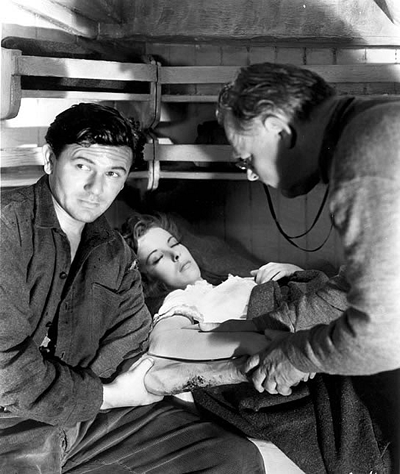 Vincent Sherman completed directing the film when Huston's wartime service began. The supporting cast includes Victor Sen Yung, Keye Luke, Charles Halton, Frank Wilcox, and Philip Ahn. William Hopper (PERRY MASON) can be spotted as a soldier early in the film. Something curious: Despite the title, the movie's action doesn't take place in the Pacific. Perhaps the title refers to the pending Japanese invasion coming from "across the Pacific"? 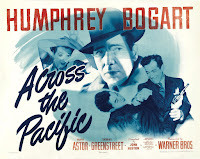 ACROSS THE PACIFIC is available on DVD in the Humphrey Bogart Signature Collection, Vol. 2. Two of the discs in my copy of this set developed playback problems roughly a decade after it was purchased so I also own this film as part of the TCM Greatest Classic Legends Film Collection. 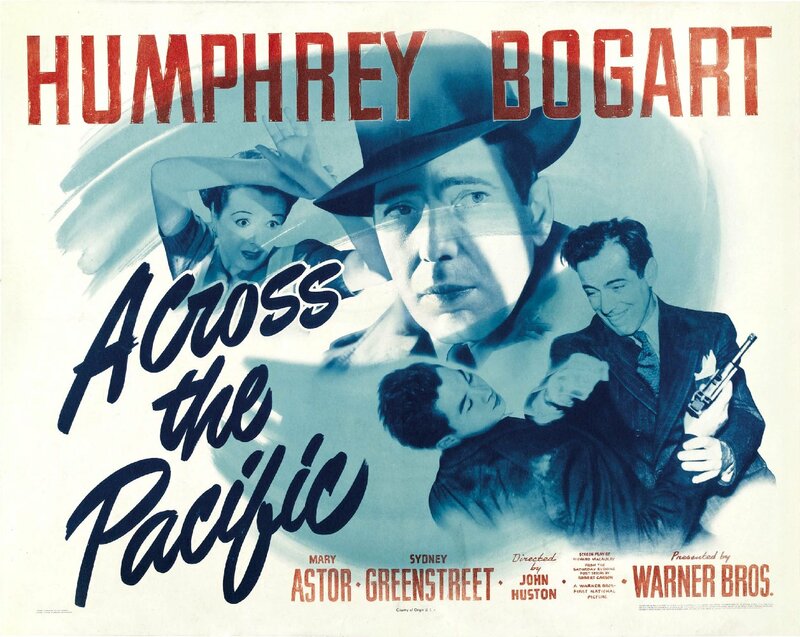 ACROSS THE PACIFIC is available digitally from Amazon Instant Video. It also had a release on VHS. This film may also be seen on Turner Classic Movies. The trailer is available on the TCM website. CHRISTMAS AT CARTWRIGHT'S (2014) is a heartwarming Christmas fantasy from the Hallmark Channel. As I have written previously, I was so busy in December I decided I'd go right ahead and keep watching Christmas movies in the New Year. I've really been enjoying my "Christmas in January and February" viewing, and I'll probably continue watching them throughout the year, especially as I have quite a backlog of appealing Hallmark titles stacked up to try! Alicia Witt of A VERY MERRY MIX-UP (2013) stars in CHRISTMAS AT CARTWRIGHT'S as Nicky Talbot, the single mother of Becky (T.J. McGibbon). It's looking like a lean Christmas as Nicky was recently laid off from her job, but through an odd series of circumstances -- or maybe it's the machinations of mysterious "Christmas consultant" Harry (Wallace Shawn) -- Nicky becomes Santa Claus at a prestigious department store. (Do prestigious department stores even exist anymore?!) Nicky is never seen outside of her costume and manages to convince everyone she's a man, albeit on the thin side for a Santa Claus. She excels in her job, instinctively knowing what each child needs thanks to what Harry calls "Santa magic." Nicky is quite taken with one of the store executives, Bill (Gabriel Hogan, who plays Norman in the MURDER, SHE BAKED movie series). Bill is equally smitten with Nicky but she feels awkward confessing that she's his store's Santa, especially after Bill tells "Santa" that he likes Nicky. Eventually, though, catty store employee Fiona (a very amusing Gabrielle Miller) discovers the truth and fires Nicky. However, Fiona's not counting on a firestorm of public dismay, nor does she realize she'll land in the doghouse with store owner Mr. Cartwright (Ron Lea). This is a very cute movie which left me with a smile on my face. Witt puts the same slightly ditzy yet sincere persona seen in A VERY MERRY MIX-UP to good use here as a woman baffled by her good fortune but more than game for the ride, even if it means speaking in a deep voice for hours on end. She's especially likeable as she works hard to be a good, supportive mother, helping her daughter through a rough patch with spelling and reading. Hogan is quite charming, and since he's stuck in the "Ralph Bellamy" also-ran role in the MURDER, SHE BAKED series it's lovely to see him in this as the leading man. He and Witt have good chemistry. There are also nice performances by Linda Kash as "Santa's No. 1 Helper," Jayne Eastwood as Nicky's landlady, and Marsha Regis as Becky's kind teacher. CHRISTMAS AT CARTWRIGHT'S was written by Margaret Oberman and directed by Graeme Campbell. It was filmed by Peter Benison with Ontario, Canada, standing in for Chicago. CHRISTMAS AT CARTWRIGHT'S is available on DVD. A digital copy may also be purchased from Amazon Instant Video. Big streaming news today regarding both the FilmStruck and Warner Archive film streaming services. It's been announced that TCM's FilmStruck service, known to this point for streaming foreign, indie, and Criterion films, will now offer a "TCM Select" collection of classic films from the Warner Bros. library. The content additions will take effect beginning today, February 26th. At the same time, Warner Archive will cease its streaming business and transition its subscribers to FilmStruck accounts. Variety quotes Warner Bros. exec Craig Hunegs as saying "We had a decision to make on Warner Archive. We were going to go bigger, add more films, and invest in improving the user experience. But after sitting down and looking at it, rather than having two overlapping services going after the same audience, we decided to combine them." TCM's Ben Mankiewicz will be recording introductions for some of the films, exclusively for FilmStruck. The service will group some films in curated collections, including a "Star of the Week" theme. A 30-second FilmStruck Twitter video announcing the news may be found here. The FilmStruck streaming service, including the TCM Select films, is $6.99 per month. Adding on the Criterion Channel raises the cost to $10.99 per month. There's also a less expensive $99 per year option, including the Criterion Channel, which comes to a savings of over $32 per year. There's no indication in any of the coverage to date that the addition of TCM Select to FilmStruck will affect Watch TCM, a streaming app available to those who subscribe to a cable service carrying TCM. 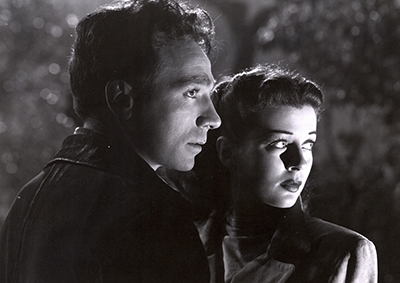 Watch TCM is available on desktop or mobile devices but is not available for streaming on TV. Coincidentally, my friend Angela has just posted detailed thoughts on subscribing to FilmStruck at The Hollywood Revue. She includes quite a bit of useful information on using the service, which will now be offering even more than she knew when writing her review! I've had a media account for Warner Archive streaming for the last few months and recently received an offer for a free month of FilmStruck. I'll probably be giving it a whirl in the near future via my Roku. I'll be reporting any future FilmStruck and TCM developments as they occur! Previously: TCM News: FilmStruck and TCM Backlot (May 22, 2016). Related: More TCM News: New Co-Hosts and Robert Osborne Award (March 2, 2018). 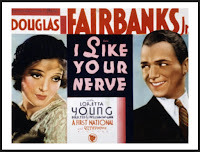 The young and oh-so-attractive Douglas Fairbanks Jr. and Loretta Young star in the romantic comedy I LIKE YOUR NERVE (1931), just released on DVD by the Warner Archive. I LIKE YOUR NERVE is a lightweight bauble set in a vague Latin American country. 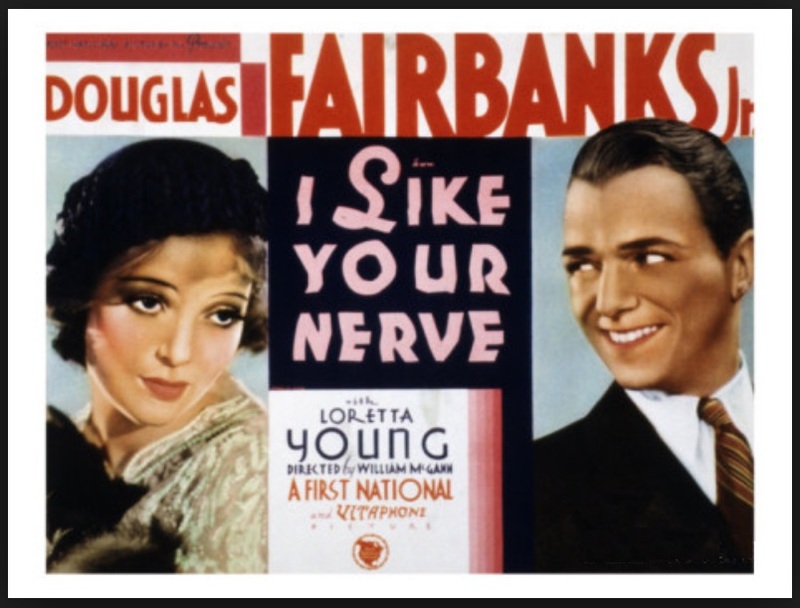 American Larry O'Brien (Fairbanks) sees lovely Diane Forsythe (Young) go by in a chauffeur-driven car and immediately comes up with a plan to meet her, which involves strewing glass on the lonely roadway so that her car will suffer flat tires on her return trip. Diane is inexplicably engaged to a much older man (Edmund Breon). Larry eventually discovers the reason why and sets out to save Diane from her unpleasant fate -- which, of course, means they can live happily ever after! There's very little to this film, with the chief fun being enjoying the beauty of the two leads, as well as the good time they seem to be having together. Short in length, it's a mildly entertaining time-passer for fans of Fairbanks and Young, but only just. It doesn't have much of a script or any substance; if only it were funnier or more romantic, with such appealing lead actors. William C. McGann directed, with photography by Ernest Haller. The supporting cast includes Boris Karloff as a butler, plus Luis Alberni, Henry Kolker, and Claude Allister. The print of this 1931 movie is somewhat soft, as films of this age tend to be, but is otherwise in good shape. The sound is slightly fuzzy, again in that "1931 way," but understandable. There are no extras on the disc. 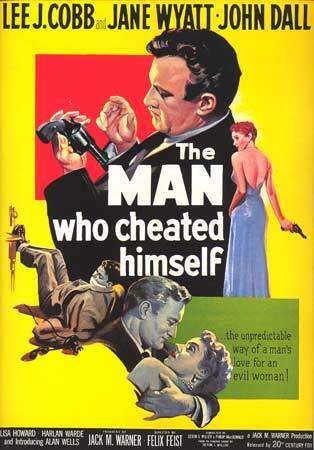 Thanks to the Warner Archive for providing a review copy of this DVD. 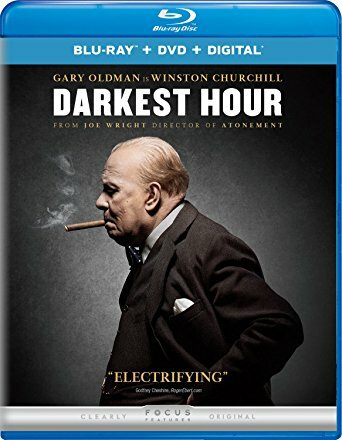 Warner Archive releases are MOD (manufactured on demand) and may be ordered from the Warner Archive Collection at the WBShop or from any online retailers where DVDs and Blu-rays are sold. A restored version of the classic adventure THE SEA WOLF (1941) is now available on Blu-ray from the Warner Archive. 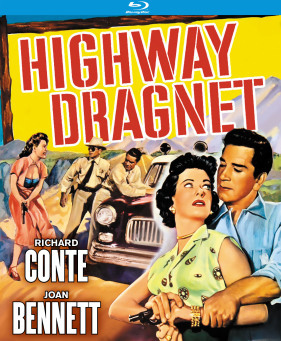 This new Warner Archive release is the first time the film has been seen in its original 100-minute release version since 1947, when 13 minutes were pared out of the film's theatrical re-release print to shorten up double bills. The restored print is thanks to a 2nd generation 35mm nitrate print from New York's Museum of Modern Art. Leonard Maltin wrote more about the restoration last fall, including informative quotes from Alan K. Rode, biographer of the film's director, Michael Curtiz. It had been over a decade since I last saw THE SEA WOLF and reviewed it here, and this print was certainly a great way to revisit it. Honestly, while there is much to admire about the film, I also find the oppressive atmosphere exhausting. Every ten years is about as often as I can handle watching it! That said, it was certainly worth it this time around to see the complete version for the first time. Based on the novel by Jack London, from a script by Robert Rossen, THE SEA WOLF is the story of sadistic sea captain Wolf Larsen (Edward G. Robinson), and those aboard his ship, the Ghost. 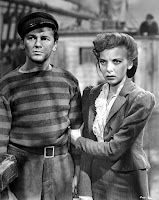 The Ghost is filled with a motley crew including George Leach (John Garfield), a fugitive who took work aboard the Ghost in order to flee San Francisco; Ruth Webster (Ida Lupino), a prison escapee picked up after a ferry wreck, along with intellectual writer Humphrey Van Weyden (Alexander Knox); a rotten cook (Barry Fitzgerald); and Dr. Prescott (Gene Lockhart), an alcoholic. Robinson's Larsen is evil personified, and the viewer's heart breaks for each of the characters he torments in turn. Leach is soon contemplating finding a way to escape, along with Ruth. Garfield and Lupino are excellent, connecting over their hard lives and discovering that perhaps they're not doomed to suffer alone through life after all. As is sometimes the case for me with other films with difficult subject matter, I found THE SEA WOLF an easier watch the second time around, knowing what to expect. It's a brutal film, but it's also a great exemplar of a Warner Bros. film of the era, a stylishly made and exciting adventure which keeps viewers on the edge of the proverbial seat, wondering how it will all turn out -- even on a second viewing. I found watching the gorgeous Warner Archive Blu-ray a satisfying experience on multiple levels. The supporting cast includes Howard Da Silva, Stanley Ridges, and David Bruce. A note for Southern Californians: A digital presentation of this restored print will be shown at UCLA on March 17th as part of the ongoing series celebrating director Michael Curtiz. The restored version will also be shown at this year's TCM Classic Film Festival. The restored black and white film, photographed by Sol Polito, looks superb on the Warner Archive Blu-ray. Sound quality is also strong. 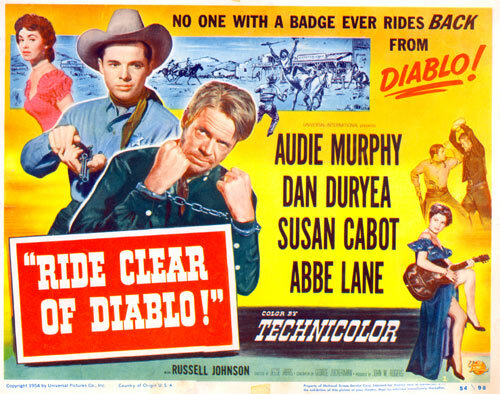 Blu-ray extras are the trailer and a 1950 Screen Directors Playhouse radio production starring Robinson. 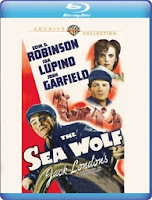 In addition to the Blu-ray reviewed here, the Warner Archive has also released THE SEA WOLF on DVD. Thanks to the Warner Archive for providing a review copy of this Blu-ray. Warner Archive Blu-rays may be ordered from the WBShop or from any online retailers where DVDs and Blu-rays are sold. 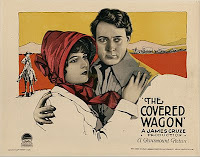 The silent epic THE COVERED WAGON (1923) was released this week on Blu-ray and DVD by Kino Lorber. 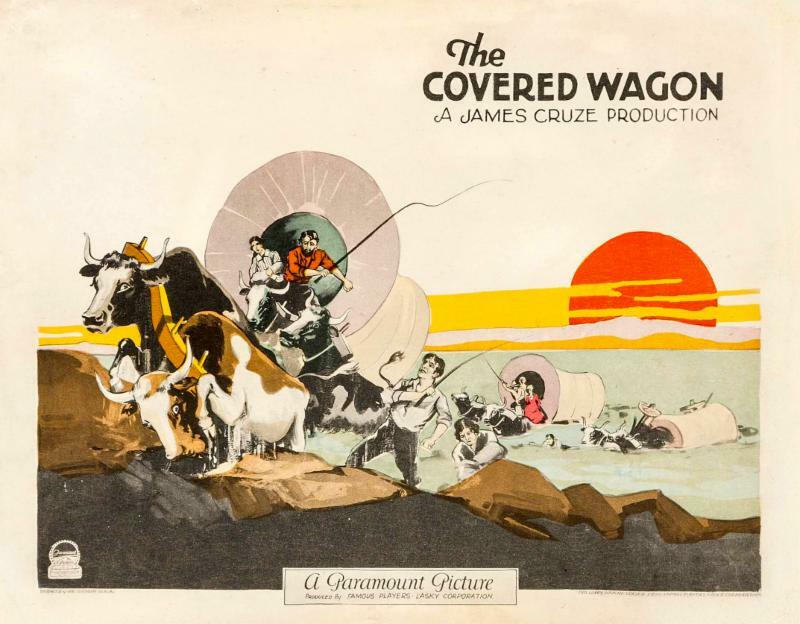 THE COVERED WAGON is an engrossing film, with impressive location filming in several states, including Utah, Nevada, and California. The movie was adapted by Jack Cunningham from a novel by Emerson Hough, directed by James Cruze and filmed by Karl Brown. The Kino Lorber Blu-ray print looks terrific, especially when one considers this movie is 95 years old. 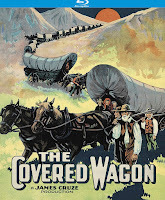 THE COVERED WAGON tells the story of two wagon train caravans journeying from Kansas City to the "promised land" of Oregon. 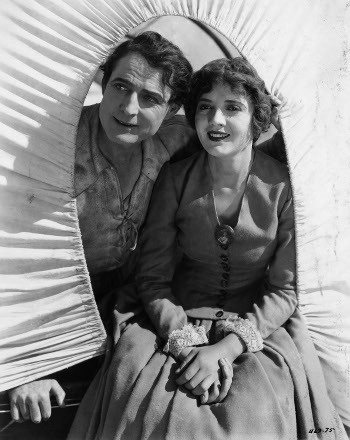 Molly (Lois Wilson) is ostensibly engaged to one caravan leader, Sam (Alan Hale Sr.), but she's been putting off marrying him and finds herself attracted to Will (J. Warren Kerrigan of CAPTAIN BLOOD), leader of the second "Liberty" caravan. Will has a mysterious past -- some say he was a cattle thief -- but it's Sam who's actually bad news, as is revealed during the long journey. Over many months the travelers face challenges from fording the Platte River to battling snow and Indians. It's a standard storyline but well told, holding the attention for the film's 98 minutes. The cast also includes Ernest Torrence and Tully Marshall, and the acting is fine, though no one really stands out. What's really impressive are the visuals; in many scenes the wagon train stretches far, far into the distance, an incredibly stirring sight, especially knowing that it's all "real," no CGI. 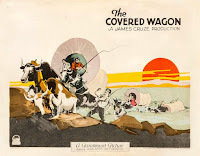 (The filmmakers were able to round up a number of covered wagons which had actually once made the journey west, which at that time was only a handful of decades in the past.) The river fording sequence and filming during a snowfall add to the realism. This film was a huge project, with hundreds of extras, not to mention livestock, filmed in locations still untouched by the 20th Century. It's all the more interesting when one realizes that this film was one of the first of its kind, paving the way for later Western epics such as John Ford's THE IRON HORSE (1924) and Raoul Walsh's THE BIG TRAIL (1930). The movie has a Wurlitzer organ score by Gaylord Carter. The commentary track is by Toby Roan, a friend of this blog who blogs himself at 50 Westerns From the 50s. I listened to it from start to finish and found it quite informative, as is always the case with Toby's commentaries. 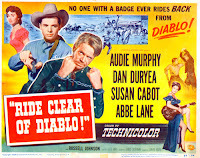 (I enjoyed hearing that some of the final shooting on the film took place near Bishop, California, an area I know well.) He'll be providing more Kino Lorber commentary tracks in the next few weeks! The case contains an attractive booklet with a good essay by Matt Hauske which helps explain THE COVERED WAGON's place in film history. The Blu-ray case contains reversible cover art; I liked the "alternate" option so well that I chose to switch mine over to the other side. For good measure the Blu-ray disc also has a short starring Shirley Temple, THE PIE-COVERED WAGON (1932). 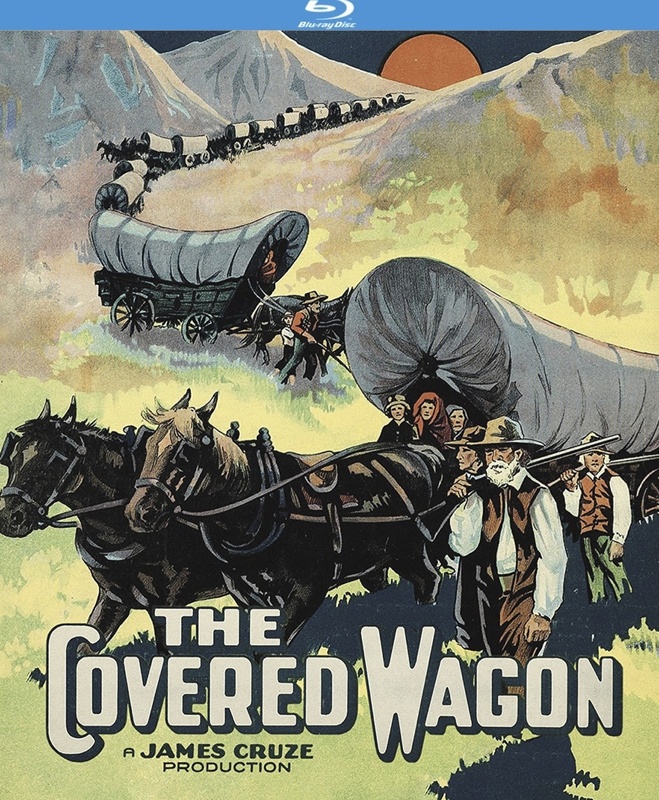 Kino Lorber's THE COVERED WAGON is a recommended release, especially for those who love Westerns and/or silent films. Thanks to Kino Lorber for providing a review copy of this Blu-ray. 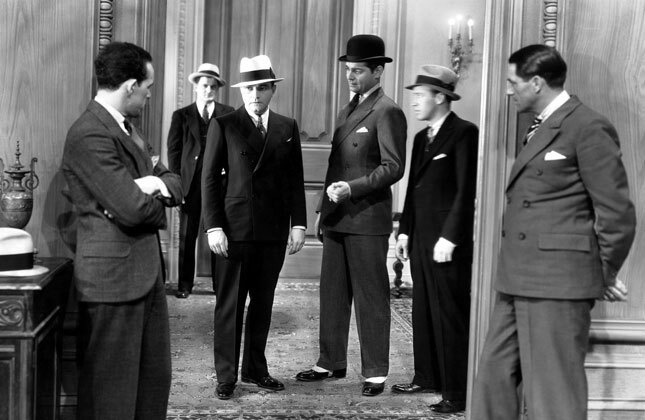 Newspapermen battling -- and being tempted by -- the Mob are the themes of THE FINGER POINTS (1931), a pre-Code drama just released on DVD by the Warner Archive. Richard Barthelmess plays Breckenridge "Breck" Lee, a reporter from the South who gets a big break working on the most prominent big city paper in the North, The Press. Breck works hard on stories aimed to help rid the town of mobsters and corruption, but his attitude changes after he ends up in the hospital for his efforts and the newspaper won't help cover his medical bills. Mobster Louis Blanco (Clark Gable) shows Breck how to pay off his bills and then some, by killing stories that will hurt the mob, keeping them from publication. Breck accepts the payoffs and dives into a luxurious new lifestyle, though it costs him the affection of Marcia (Fay Wray), the newspaper columnist he hopes to marry. Marcia happens to see Breck taking money out of his safe deposit box and puts two and two together with the fact that Breck is clearly no longer living on $35 a week plus carfare. Breck eventually convinces Marcia that he's actually been battling the mobsters behind the scenes by infiltrating them, casting himself in a brave new light, and she agrees to marry him and run away to a safer location. Breck has every intention of clearing the cash out of his safe deposit box first, of course. And what Breck doesn't know is that fellow reporter Breezy (Regis Toomey) is about to bust wide open a story for which Breck took a huge payoff, committing to keep it out of the paper. There are a lot of things about this little film to like, starting with the newspaper setting. I loved the big signs on the wall, such as "IS IT INTERESTING?" Though I must say it's the filthiest newsroom I've ever seen in a movie; the actors have to wade through piles of trash all over the floor! The story itself, by John Monk Saunders and W.R. Burnett, is an interesting premise, though unfortunately it's nearly killed by Barthelmess, a colorless, slow-speaking actor who periodically grinds the film to a halt with his plodding line readings. 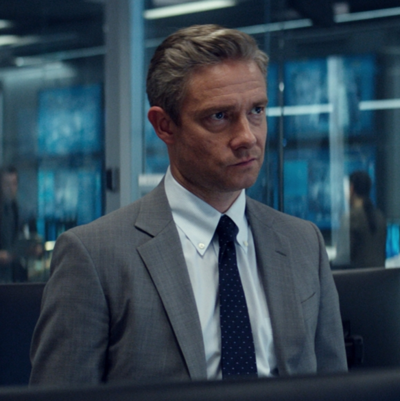 I found it interesting that in one dramatic scene in particular, the camera only shows the side or back of his head, remaining on the more interesting Wray's face throughout. 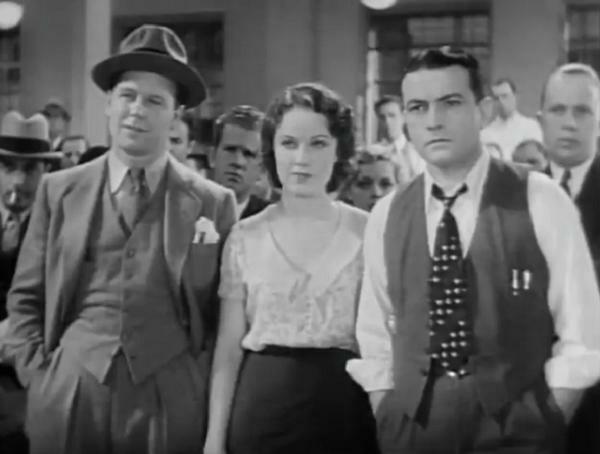 Fortunately the film is saved not only by a decent story and setting but a superb supporting cast in Wray, Toomey, and Gable. Wray is simply gorgeous as a smart cookie making her own way in a newspaper career, and I've always liked Toomey. In a scene where he feeds Wray donuts and coffee and asks what it will take for her to "go" for him, I was silently urging her that Toomey was a better choice than Barthelmess! As for Gable, he's positively electric. He dominates all his scenes with the ostensible "star," Barthelmess; they seem to be playing two completely different games, so to speak. It's fascinating to see the charismatic star power Gable exudes even in a very early role. 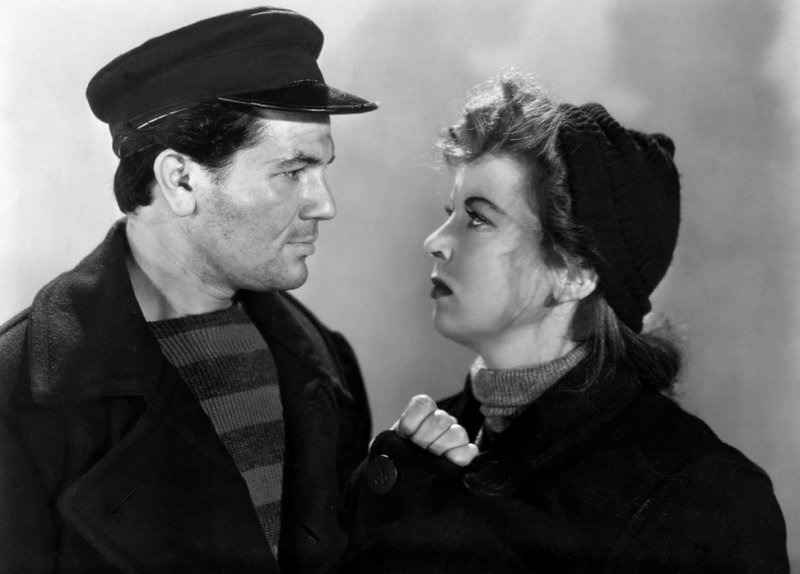 I found the film particularly valuable to see in the context of Gable's career. 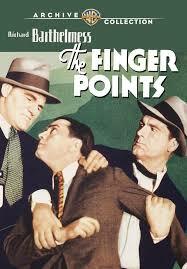 THE FINGER POINTS was directed by John Francis Dillon and filmed by Ernest Haller. The supporting cast includes Robert Elliott, Oscar Apfel, and Robert Gleckler. IMDb lists the film as 90 minutes long, but the Warner Archive disc runs 85 minutes. I didn't notice anything which overtly seemed to be missing storywise, and frankly the movie could easily have been speeded up, if only by having Barthelmess talk faster! 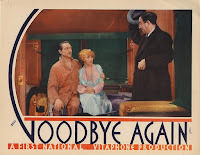 The print of this 1931 film is soft but overall it looks fine. The sound has more static than I would have wished for, though I didn't have any difficulty understanding the dialogue. There are no extras. 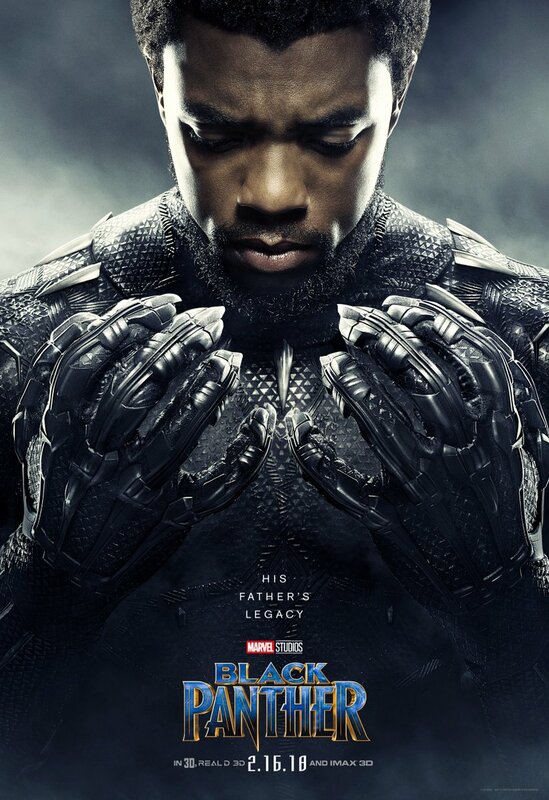 BLACK PANTHER (2018) is a strong new entry in the consistently well-done, entertaining films of the Marvel Cinematic Universe. Like Marvel's THOR (2011), BLACK PANTHER is a tale of "earning the throne," yet the movies couldn't be more stylistically different, which is part of the wonder of this Marvel series. The MCU encompasses everything from the Nordic mythology of Thor and Loki to the zany Guardians of the Galaxy, from stalwart Captain America to an ordinary dad turned into a miniature Ant-Man; yet while the movies all have their own stamp -- thanks in part to the unique vision of each film's director -- they also form a cohesive whole, populating the same universe. It's great fun to see the characters cross paths in the various films; for example, is there anything better than Thor confronting the motley crew who comprise the Guardians of the Galaxy at the end of the AVENGERS: INFINITY WAR trailer? 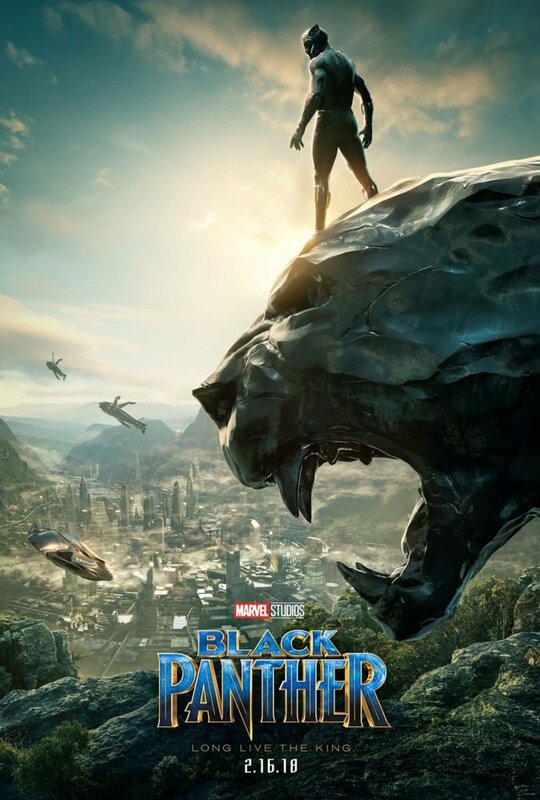 BLACK PANTHER originates from a comic book of just over a half century ago, yet as I watched I couldn't help thinking that it was Marvel meets THE LION KING (1994). Each film tells the tale of a royal family in Africa, reflecting the "circle of life," and the familiar themes continue from there. Black Panther, also known as T'Challa (Chadwick Boseman), is the new king of the mysterious African kingdom of Wakanda. T'Challa's father T'Chaka (John Kani) died tragically in a previous entry in the series, and now it's time for T'Challa to take his place on the throne. Wakanda hides in plan sight, seeming to be a poor country, while it's actually a wealthy technological powerhouse thanks to vibranium, the same material which goes into Captain America's shield. 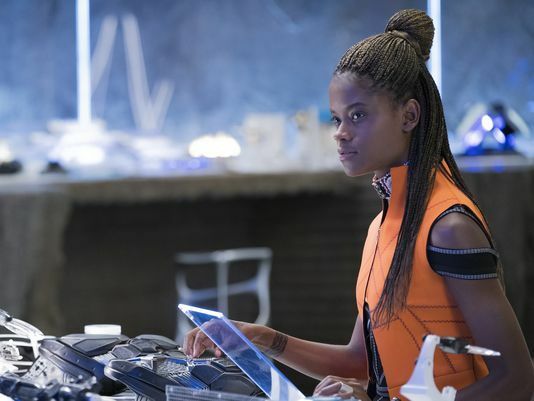 Wakanda has remained isolated, keeping vibranium out of the hands of bad actors, but T'Challa's once and future significant other, Nakia (Lupita Nyong'o), believes Wakanda has an obligation to help the world. Unfortunately such debates must be put off, along with finding the man responsible for T'Chaka's death, as it seems that T'Chaka had a disloyal brother (Uncle Scar, anyone?) whose son, Erik Killmonger (Michael B. Jordan), arrives in Wakanda to challenge T'Challa for the throne. And Killmonger is really bad news. BLACK PANTHER is a wonderful melding of the terrifically creative with the familiar, such as T'Challa being guided by his father's spirit (more borrowing from THE LION KING). I also liked what a friend pointed out on Twitter, that the opening of the film is thematically very similar to GUARDIANS OF THE GALAXY (2014); in each a young boy experiences tragedy and witnesses something amazing from outer space, but from there, their lives go in completely different directions. Many viewers have also picked up on a bit of a James Bond theme, with T'Challa's sister Shuri (Letitia Wright) serving as a sort of "Q," inventing all manner of gadgets for her brother to use when acting as a superhero. 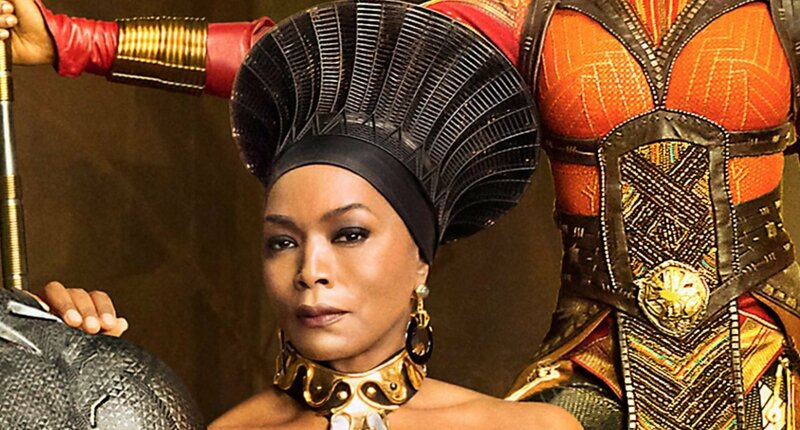 At the same time as it presents its spin on classic themes, the film is bursting with unique visuals and characters, such as Danai Gurira's leader of the royal guard, the Dora Milaje. The movie could rate a second look just to more completely take in everything that's on the screen, let alone the story! I really enjoyed Boseman, whose character is a compelling mixture of confidence and uncertainty, as he strives to be worthy of his new role(s). Now I want to go back and take a look at DRAFT DAY (2014) again, as well as check out 42 (2013) and MARSHALL (2017), which are both in my viewing stack. The film is noteworthy for several strong women's roles, as played by the actresses noted above. Martin Freeman is also on hand as Everett Ross, an American agent who joins forces with T'Challa's family after they save his life. The cast also includes Angela Bassett, Forest Whitaker, Sterling K. Brown, Daniel Kaluuya, and Andy Serkis. BLACK PANTHER was directed by Ryan Coogler, who also directed this film's villain, Jordan, in CREED (2015). CREED costar Tessa Thompson joined the MCU last time around in THOR: RAGNAROK (2017). The movie was filmed by Rachel Morrison. It runs 2 hours and 14 minutes. Parental Advisory: This film is rated PG-13. There are a couple disturbing yet bloodless deaths. Mostly it's the usual Marvel cartoon violence. 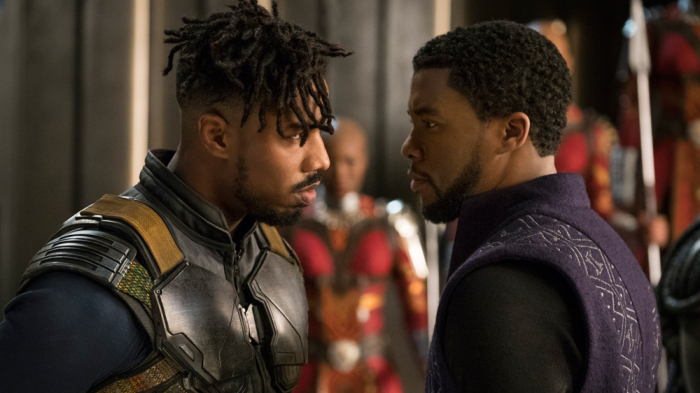 BLACK PANTHER opened to strong reviews, including from Kenneth Turan of the Los Angeles Times, who wrote "This is the model of what an involving popular entertainment should be. And even something more." 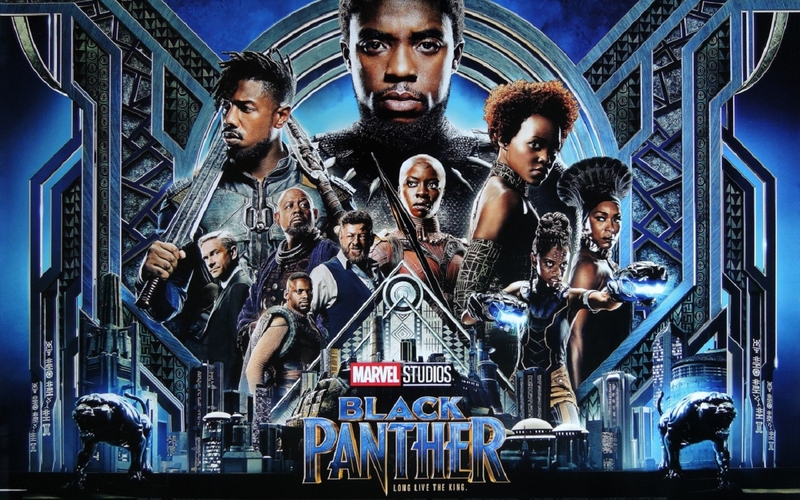 It received a four-star review from Brian Truitt at USA Today, while Leonard Maltin writes that "Black Panther has already generated enough hype for multiple movies…and delivers on its promise to an eager audience." Previous Marvel reviews: IRON MAN (2008), IRON MAN 2 (2010), CAPTAIN AMERICA: THE FIRST AVENGER (2011), THOR (2011), THE AVENGERS (2012), IRON MAN 3 (2013), THOR: THE DARK WORLD (2013), CAPTAIN AMERICA: THE WINTER SOLDIER (2014), GUARDIANS OF THE GALAXY (2014), AGENT CARTER (2015), ANT-MAN (2015), AVENGERS: AGE OF ULTRON (2015), CAPTAIN AMERICA: CIVIL WAR (2016), DOCTOR STRANGE (2016), GUARDIANS OF THE GALAXY VOL. 2 (2017), SPIDER-MAN: HOMECOMING (2017), and THOR: RAGNAROK (2017). Coming next from Marvel: AVENGERS: INFINITY WAR (2018) on May 4th and ANT-MAN AND THE WASP (2018) on July 6th. 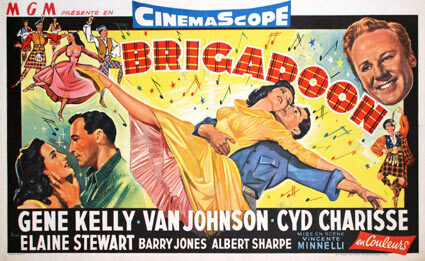 Last night I pulled out an old favorite, BRIGADOON (1954), from the review stack. I'm thrilled to say the movie has never looked better than it does on the Warner Archive Blu-ray, released last fall. 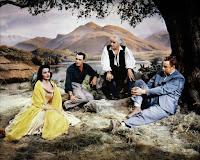 Though I'm just now reviewing the BRIGADOON Blu-ray, it's not for lack of interest. BRIGADOON has been a favorite of mine since I first fell in love with MGM musicals as a pre-teenager. Though some critics find fault with it, particularly the set design, it's always been special to me, and it continues to be so to this day. The movie is a filming of the 1947-48 Lerner and Loewe Broadway production; the film was produced by Arthur Freed and directed by Vincente Minnelli. 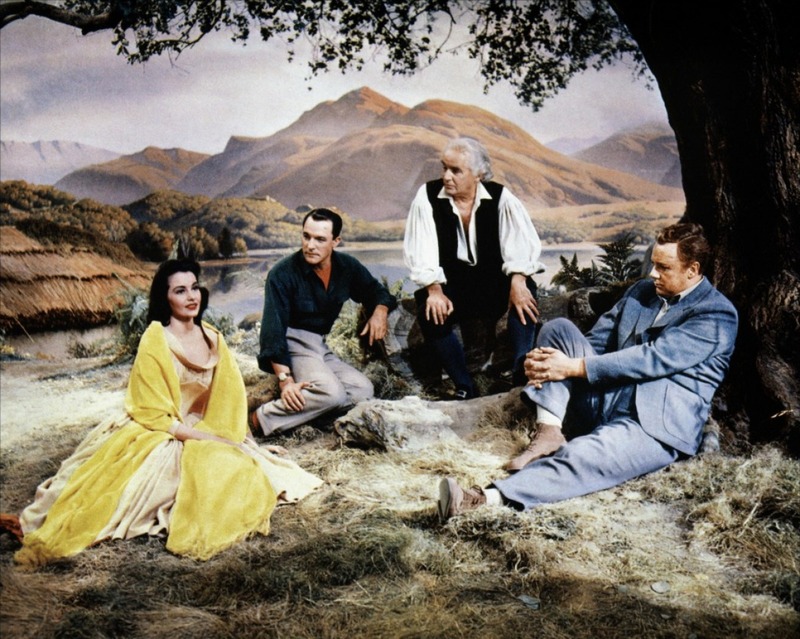 Two Americans, Tommy (Gene Kelly) and Jeff (Van Johnson), become lost during a hunting trip in Scotland and stumble across an odd little village, Brigadoon, which isn't on their map. Tommy quickly falls in love with beautiful Fiona (Cyd Charisse), while the more cynical Jeff takes in the strange goings-on in the town with a jaundiced eye. 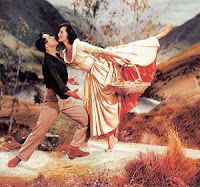 Brigadoon seems strangely lost in an older time, and when Tommy sees some confusing dates in Fiona's family Bible, she takes him to the village schoolmaster, Mr. Lundie (Barry Jones) for an explanation. It's a long story which boils down to a miracle: The people of Brigadoon are essentially still living in the 1700s, with the village appearing for just one day every century. An outsider can remain in the village if he loves someone enough...and so Tommy has a big decision to make. I simply love getting lost in the story, the gorgeous music, and the film's look. The Blu-ray is truly beautiful, bringing out the best in the film's fairly plain Ansco Color; Cyd Charisse's orange underskirt and yellow shawl, and later her red dress and green shawl -- matching Kelly's green shirt -- are the best they've ever looked. The one aspect which might not have completely held up for me over the years is Kelly's performance; he's supposed to be a cynical American, though not as far gone as Johnson's character, but the character I saw as wildly romantic when I was a teenager now seems just a little too slick. 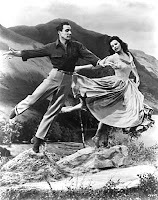 This aspect of his performance does soften as the film goes on and Fiona and Brigadoon win Tommy's heart; and in great moments like "The Heather on the Hill" dance with Charisse, any uncertainty about him is forgiven. I also really like Kelly's performance of "Almost Like Being in Love." I'm a big fan of Cyd Charisse and she's simply lovely in this; in addition to her spot-on performance and gorgeous dancing, she's perfectly dubbed by Carol Richards, who would provide Charisse's singing voice in three additional MGM musicals. Jimmy Thompson and Virginia Bosler are nicely cast as Fiona's sister and her fiance, who are front and center during the film's extended wedding sequence late in the movie. BRIGADOON comes most strongly alive during this section of the film, from the "Gathering of the Clans" through the "Wedding Dance." The choreography, Conrad Salinger's orchestrations, Irene Sharaff's Oscar-nominated costuming, and Joseph Ruttenberg's best camera work in the movie, fully utilizing the CinemaScope screen, combine for a thrilling experience. The high-stepping Scottish dancers in their colorful tartans never fail to give me goosebumps. Outstanding extras carried over from the original DVD release include three deleted musical numbers, one audio outtake, and the trailer. During this viewing I took the time to pause the movie and watch the deleted songs where they would have fit in the movie, which really added to my experience. The finished film isn't particularly long at 108 minutes, and I regret that all of these numbers were cut, especially the lilting "Come to Me, Bend to Me," sung by John Gustafson, dubbing Jimmy Thompson. The scene where Thompson sings the song to his bride-to-be, Bosler, is touching. Rather than chapter selections, the disc features a song selection option, a feature I appreciate very much. 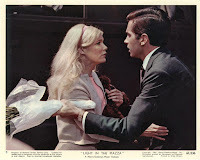 The supporting cast includes Albert Sharpe, Hugh Laing, Tudor Owen, Dee Turnell, Dodie Heath, Eddie Quillan, Madge Blake, and in one scene near the end of the film, gorgeous Elaine Stewart. 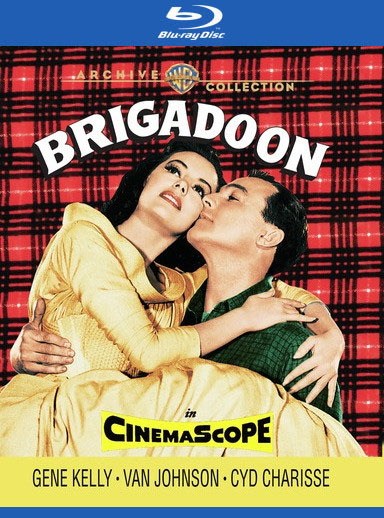 The Warner Archive BRIGADOON Blu-ray is a must for fans of musicals in general and BRIGADOON in particular. 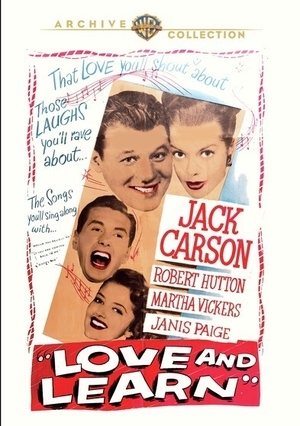 ...Coming to the Warner Archive this week: A GIRL, A GUY, AND A GOB (1941) with Lucille Ball, Edmond O'Brien, and George Murphy, listed on the WAC site here, and Jack Carson and Janis Paige in LOVE AND LEARN (1947), listed here. ...Here's a trailer for an upcoming WWII-era film starring Lily James and Matthew Goode. The film's wordy title is THE GUERNSEY LITERARY & POTATO PEEL PIE SOCIETY. No U.S. release date is set. ...New from Cook's Illustrated in April: DINNER ILLUSTRATED: 175 MEALS READY IN 1 HOUR OR LESS. ...A few days after I watched Tim Holt in THE ROOKIE COP (1939), Jessica reviewed it as part of her recently started series "Watching 1939." ...One of the things which makes me happiest is recommending a movie and later hearing that someone else enjoyed it. In just the last few days I've learned that my friend Jessica enjoyed Belita in LADY, LET'S DANCE! (1944), which she wrote about here; Raquel enjoyed Saoirse Ronan in BROOKLYN (2015), which she wrote about here; the Self-Styled Siren liked Audie Murphy and Dan Duryea in RIDE CLEAR OF DIABLO (1954); and Mel enjoyed the Hallmark Hall of Fame film LOVING LEAH (2009). It was a great week for recommendations, and hearing this news was really wonderful. Thank you all for the feedback! I hope more readers will check out these most enjoyable films. ...Earlier this month Parade magazine featured a nice article on Hallmark movies, including interviews with several actors who regularly appear in Hallmark films. 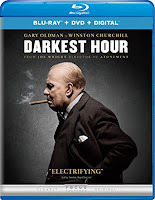 ...Three late 2017 releases are coming out on Blu-ray and DVD on February 27th: DARKEST HOUR (2017), which I reviewed here; MURDER ON THE ORIENT EXPRESS (2017), reviewed here; and COCO (2017), reviewed here. ...Congratulations to Raquel on 1,000 posts at her blog Out of the Past! 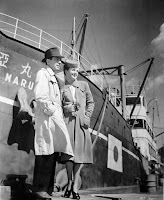 Raquel recently started a sister blog, Bygone Voyager, to discuss historical movies and TV programs. ...Here's an article on film preservation at Paramount Pictures. 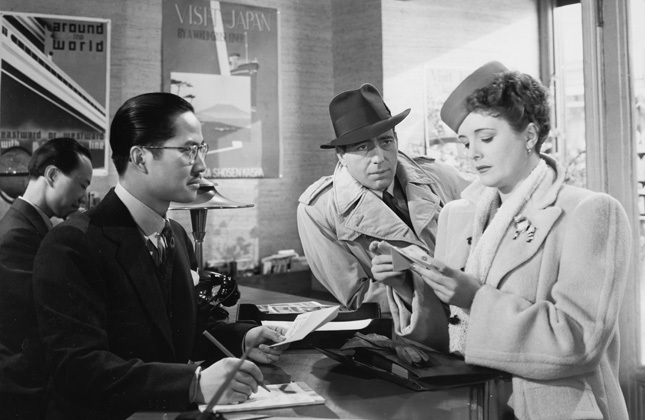 ...Kristen of Journeys in Classic Film recently reviewed THE LADY FROM CHEYENNE (1941), a delightful film starring Loretta Young and Robert Preston. It's a movie which very much needs a DVD release! 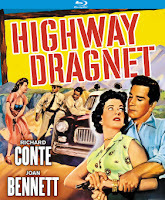 ...Kino Lorber Studio Classics reviews coming to my site in March: Richard Conte, Joan Bennett, and Wanda Hendrix in HIGHWAY DRAGNET (1954) and Richard Dix and Irene Dunne in STINGAREE (1934). ...More exciting Kino Lorber news for April: Releases of TRIGGER, JR. (1950) and SINGING GUNS (1950), both with commentary tracks by Toby Roan of 50 Westerns From the 50s. William Witney's son Jay Dee Witney will also participate in the TRIGGER, JR. commentary. ...Notable Passings: I was very sorry to learn of the passing of singer-actor Vic Damone. Damone appeared in several MGM musicals in the '50s including RICH, YOUNG AND PRETTY (1951), ATHENA (1954), DEEP IN MY HEART (1954), HIT THE DECK (1955), and KISMET (1955)...Glen Holt, the widower of Annette Funicello, has died at the age of 87. Annette passed on nearly five years ago, in April 2013...Writer Bill Crider died this week at 76. I enjoyed peeking in on his blog from time to time as he was a film fan and he also liked to feature great vintage advertising at his site. ...For more recent links on classic movies and more, please check out my February 11th link roundup. 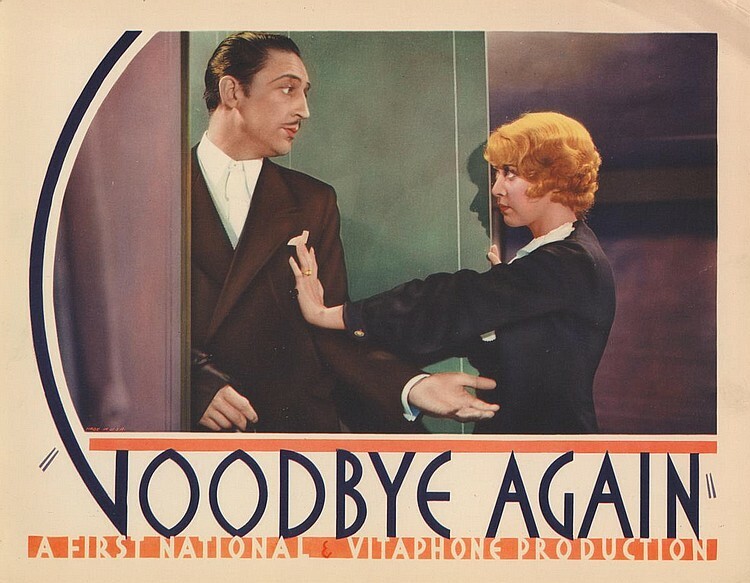 Warren William and Joan Blondell star in GOODBYE AGAIN (1933), a pre-Code comedy just released on DVD by the Warner Archive. William plays Kenneth Bixby, author of successful romantic novels who's currently in the midst of a publicity tour. 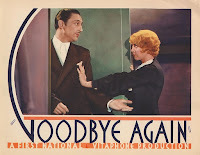 Bixby is reunited with a forgotten old flame, Julie (Genevieve Tobin); he may have forgotten her but he certainly doesn't mind picking up again where they left off, despite the fact that she's married to Harvey (Hugh Herbert, less annoying than usual). Hotel or train, everywhere Bixby goes, Julie follows, and it's quite clear they're they're engaged in a steamy affair. Bixby's secretary Anne (Blondell) is concerned and jealous, and Julie's husband, sister (Helen Chandler), and future brother-in-law (Wallace Ford) are also intent on breaking up Bixby and Julie's new romance. The movie was loosely remade with George Brent as HONEYMOON FOR THREE (1941), and while I think I liked the remake better, this original version zips by in a quick 66 minutes. It's nonsensical, but watching William and Tobin both acting like utter dingbats has its charms; William has such a dignified appearance, yet he was unafraid to be utterly silly on screen. Blondell is, of course, always a welcome screen presence, though her role is less flashy than Tobin's. There's also quite a bit of subtly racy dialogue scattered throughout which periodically startles a fading viewer back into playing close attention once more. A random comment: I love both Tobin and Blondell, but they look so very much alike in this, it might have been easier for viewers if their appearances had been differentiated more. 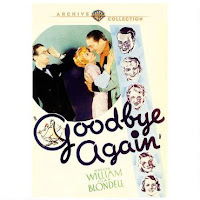 GOODBYE AGAIN was filmed by George Barnes. The supporting cast includes Hobart Cavanaugh, Fred "Snowflake" Toones, and Ruth Donnelly. The Warner Archive DVD has a good print, if slightly soft in a typical early '30s way, and fine sound. There are no extras.